This post is sponsored by Tradlands. My thoughts and opinions expressed here are my own. Thank you for supporting brands I support. I’ve been on the hunt for the perfect jean jacket for awhile now. And by perfect, I mean the perfect boyfriend fit jean jacket. The reason why I’ve been into boyfriend jean jackets is because I love that the length is longer than your typical jean jacket. For instance, the jean jacket I wore in this post is great but it stops right at the waist. Most of my tops go past the waist. I also like my jean jacket to have more room. Other jean jackets I have owned get so snug around the armpit area. So I am limited to what I can layer with it. 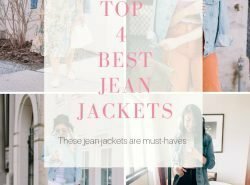 When my sister purchased a boyfriend jean jacket, I was hooked! It was EXACTLY what I was looking for in a perfect jean jacket. When my sister told me it is boyfriend fit style, my hunt began. Unfortunately, my search had been unsuccessful for the past year. I found several boyfriend fit jean jackets, but they didn’t fit quite right. They were either too heavy (the denim fabric had too much weight on it) or too bulky. So bulky that it looked like I was wearing my dad’s jean jacket. 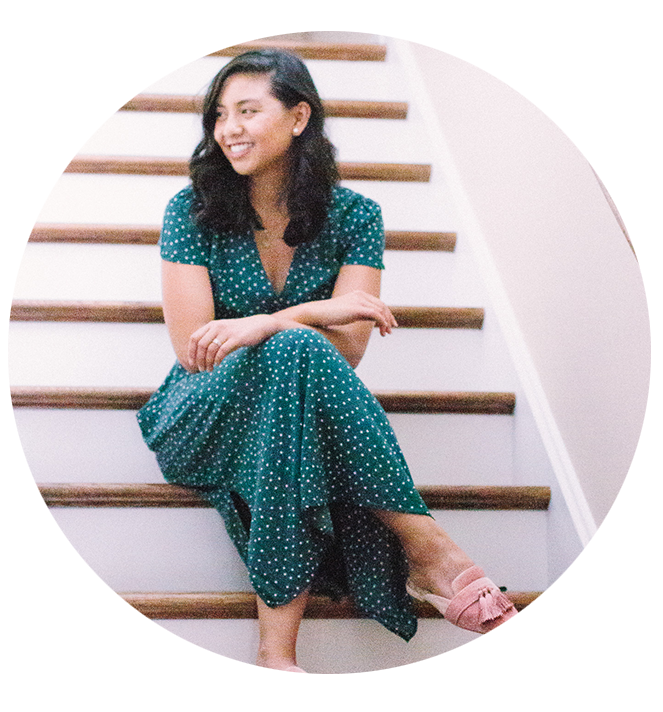 Then I discovered Tradlands and my perfect jean jacket hunt was over. This jean jacket was seriously the perfect fit. 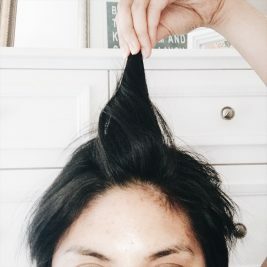 The length was just right and it has a boxy fit without looking bulky. It looks like it was made for me. And the denim fabric feels so soft and lightweight. I don’t need to worry about it weighing me down. Oh, did I mention it has a slight stretch? It makes it even more comfortable. The jacket fits true to size. I’m wearing a size small and it fits comfortably. It also has room to layer. That’s how I was able to wear the Jessica Grey shirt (also fits TTS) with the jean jacket. No issues feeling snug! Woohoo! 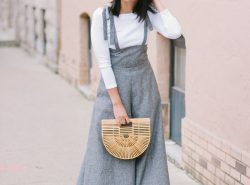 Tradlands is a clothing company I recently discovered and I instantly fell in love with their pieces! If you are into well-made classic pieces, then you are in for a treat! Tradlands specializes in clothing that is menswear-inspired with a feminine flair. This means that a woman can rock the menswear style, but still have a fit for a woman. Basically, I interpret it as a woman can look chic in menswear. But let’s be real, actual menswear clothes are not fit for a woman’s body. Women have curves and all other feminine features that menswear styles don’t consider. 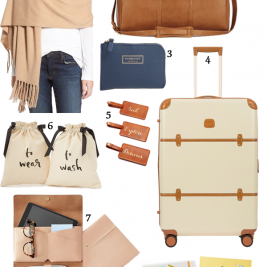 Well, Tradlands has nailed it. They really do focus on fit, details, and quality. Plus, their clothing is produced ethically and sustainably. So they are definitely a brand you can trust. By the way, if you are thinking of getting anything from Tradlands, you can get an extra 15% off by using the promo code ‘springlayering’. This promo code ends on April 23rd. So are you obsessed with this jean jacket like I am? If you are, today is your lucky day! 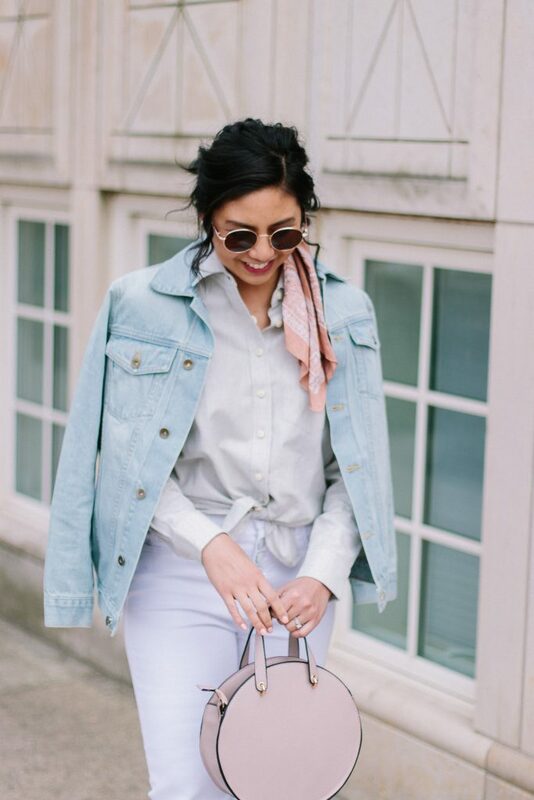 I am collaborating with Tradlands to give away this exact jean jacket to one lucky reader! Trust me, this is one layering piece you will be wearing nonstop. It is so versatile! In order to enter to win, you will have to find this photo below on my Instagram account. Follow the instructions on the caption of the photo. I promise it is a short entry! I always try to keep my Instagram giveaway entries short and sweet. Plus, you have the option to enter daily. The more you enter, the more chances you have to win! Good luck to all the participants. The giveaway will end next week, April 16th! Such a cute outfit Rach! 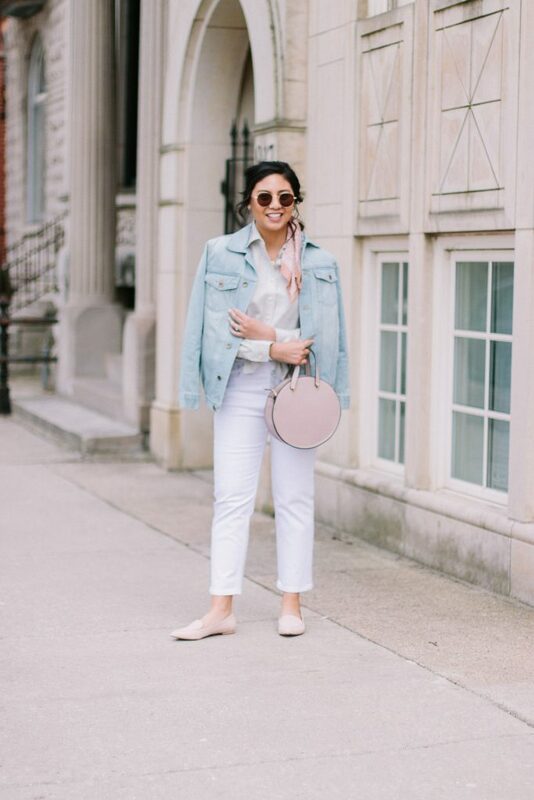 Love your jean jacket and round handbag! I cannot find this photo on Instagram. It will be up around noon CST. I apologize if there was any confusion! I absolutely love this look!! The bandana tied in the hair is the cutest touch, and I love everything you’ve done here! This look is so cute girl! 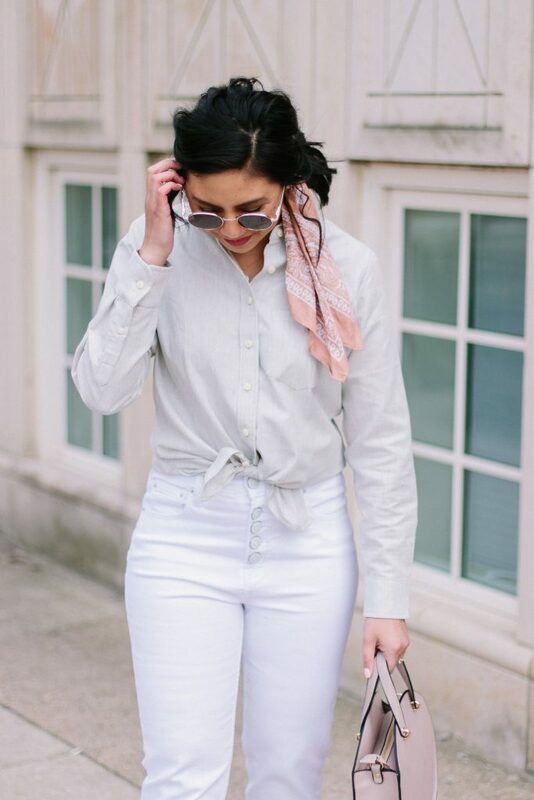 I just found your blog via Bryn’s blog and I am LOVING your spring style! 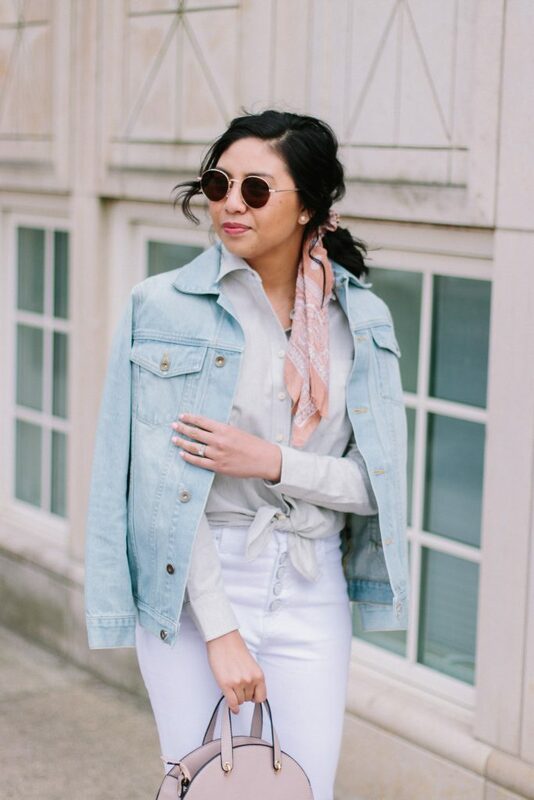 My denim jacket is also such a staple for spring layering because the boyfriend fit somehow just works with everything! Thank you Caroline, you are so sweet! Aren’t they the best?! Love the scarf in your hair. This looks like a great jean jacket. I own one denim jacket and sometimes it looks good on me, while other times it looks like a total mess, lol. Thank you Cheryl! Girl, I don’t think it is possible for you to look like a mess! This might be my fave look of yours! SO chic and cute at the same time, mahal! A jean jacket is what my closet needs! I have never owned one and really should invest in one! 🙂 Love this classic look! Definitely need one! I definitely recommend this one! I’m seriously into this denim jacket! I’ve had the same one for years and I could use an update (or at least a second one for spring hehe)! Loving the lighter wash and boyfriend fit! You are always such a babe! 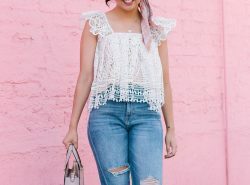 I love the fit on you and the pastel colours are perfect for spring! Such an adorable denim jacket!! Love how it’s more of a boyfriend fit and how you styled it. So cute! Great look, love this jacket! Have a great week! Love everything about your look. You look so chic. That denim jacket is the cutest. This jacket is so cute! I love the boyfriend fit on you and these accessories are great! I love how you styled the jacket with this look. 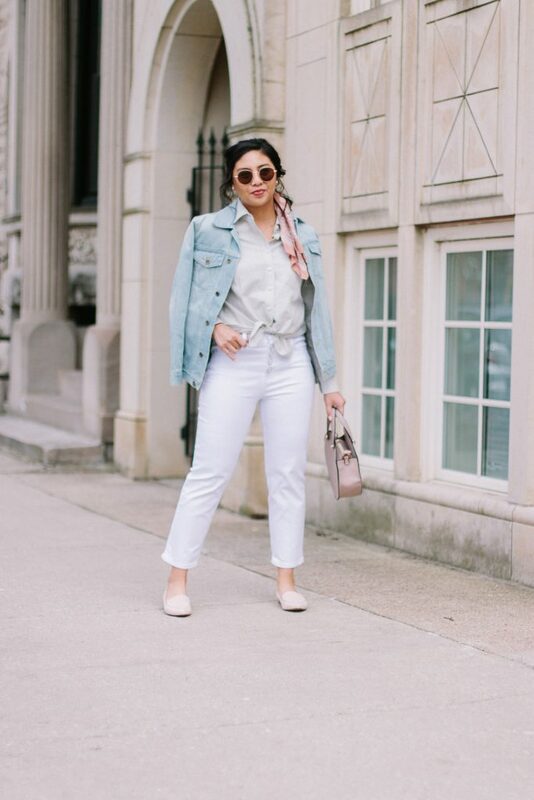 It’s an awesome casual look and the light wash is perfect for spring. Thanks for sharing! 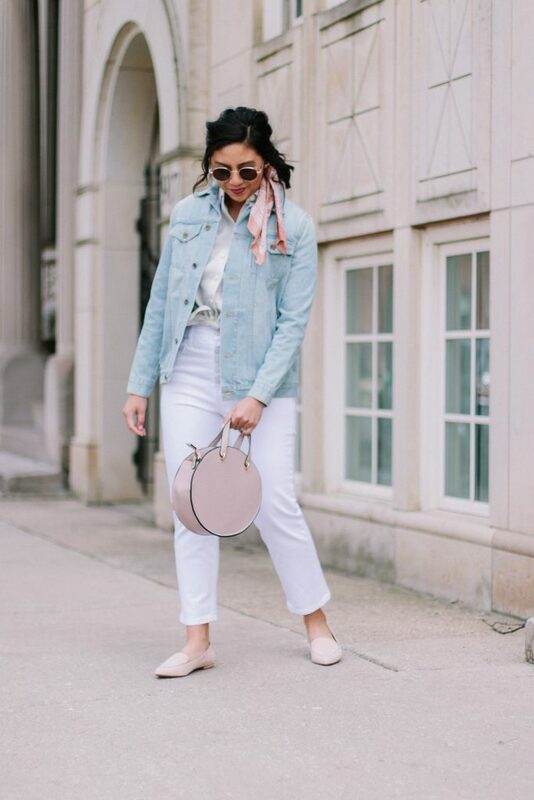 Loving these spring neutrals. The pink accessories and the jean jacket is perfection! Those are my thoughts too! This is a awesome jean jacket. Thanks for sharing. They are the best layering piece! Been wearing mine every day too! And thanks so much! Love the soft colors in this look. Also how cute is that bag. This whole outfit is soooo cute! It’s probably my very favorite of yours! I love wearing denim jackets in the Spring! I have 3 in different colours and styles. 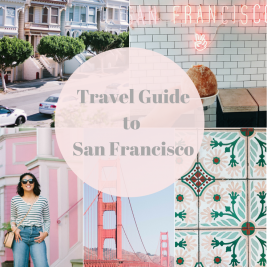 Great guide, and super cute photos Rach!! Me too! Oh I need more colors haha! I have been wanting a lighter color boyfriend fit jean jacket. This one is so cute!! Good find! This jean jacket would look so good on you Amy Ann! I love this outfit!! The style of that denim jacket is on point and I’m loving your jeans too! I’m with you – the light wash boyfriend style really is perfection! 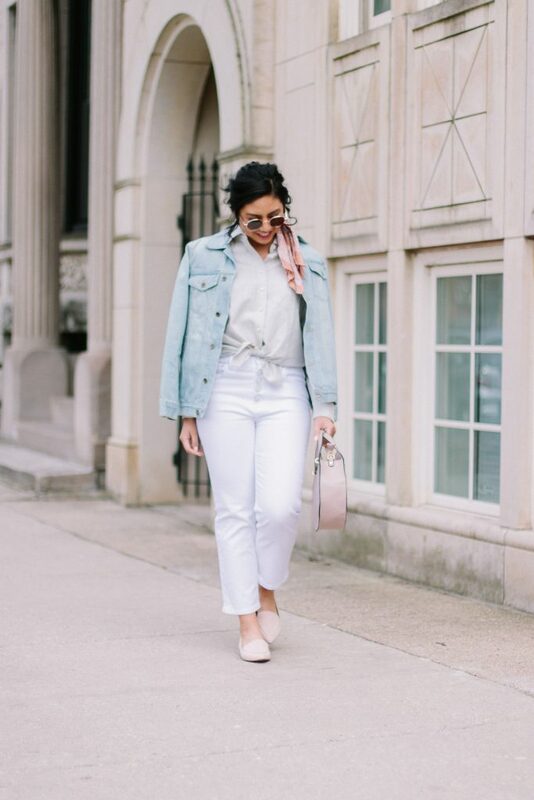 Your pastel shades have such good spring vibes too. What a gorgeous pairing of light pastel tones my dear! This boyfriend fit is absolutely perfect and it makes the look even more cool and casual! Ohmygosh that jacket is perfect! I love the oversized fit! How comfy! I wish I could pul of pastel colors and a girly style like you do ! This is such a cute color combination you have here dear! 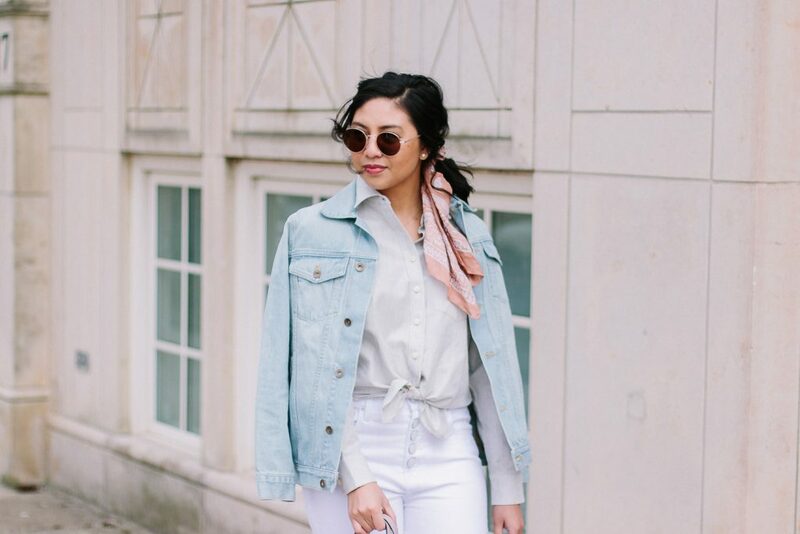 I love shirt and white denim pants, and that faded denim jacket simply wraps up the look! You look so chic, I love that bag!